Roman metal working site and multi-period finds. Intensive metal-detecting on this site between 1982 and 2013 has recovered an astounding number of objects from the Bronze Age to post-medieval periods. A large proportion of the objects are Roman in date, including hundreds of coins and many brooches. Scrap metal and slag have also been frequent finds at this site, examination of which has suggested that smithing took place here, probably during the Roman period. The ornate nature of many of the brooches, which appear to have seen use, is thought to indicate a possible votive function, which may explain the large number of coins. Other objects include a Neolithic leaf arrowhead and polished axehead, as well as a Bronze Age spearhead, chisel, sword or rapier and axeheads. An unusually large number of Iron Age coins have also been retrieved, as well as a brooch and harness or strap fittings. An Early Saxon brooch, Middle Saxon pin and a number of medieval and post-medieval objects have been recorded including a medieval brooch made from a jetton. January 1982 onwards. Metal-detecting and fieldwalking. Coins, pottery and metalwork extending Roman spread (S1). E. Rose (NAU), 14 June 1982. Late Bronze Age spearhead, socketed axe (S7), chisel and sword, (S6). E. Rose (NAU), 27 January 1986 & 1998. 15 June 1989. NAU aerial photography. Two parallel cropmarks which have since been recorded separately as NHER 57444. Iron Age Iceni face/horse coin. Weight 1.22grams. W. Milligan (NCM), 12 December 1991. See coin list in file. W. Milligan (NCM), 22 March 1996. W. Milligan (NCM), 25 November 1993. W. Milligan (NCM), 21 March 1996. Colchester-derivative brooch dating from ?AD 60 to ?AD 120. Iceni Bury Type A coin. Copper alloy boss (filled with lead), no sign of attachment. Badly accreted plate brooch dating from the 2nd century. Three 3rd to 4th century coins. Samian ware sherds (two decorated, two plain). Trumpet standard dating from around AD 75 to AD 175. Roman plate brooch dating from around AD 40 to AD 75. See (S1). Three copper alloy pellets (waste). 6 October 1993 and November 1993. Metal-detecting. Roman copper alloy vessel rim fragment. Three 1st to 3rd century coins. Accreted copper alloy (looks like iron) stud. Condition suggests that this is Roman. Lead sheet with rivet holes, unknown date. W. Milligan (NCM), 24 November 1993. Two copper alloy waste (probably Roman). Three Roman brooches, one Colchester derivative, two 2nd century plate brooches. Two 3rd to 4th century coins. Iron Age early face/horse A. Late 1st century trumpet brooch. See coin lists in file. Iron Age Iceni face/horse C.
Iceni face/horse coin (heavily iron stained). Copper alloy decorated sleeve, probably Roman. Lead 'knob' like copper alloy knob from Early Saxon brooches. Two Roman brooches, one 2nd century plate brooch, one ?Hod Hill type brooch (before AD 75). British plate brooch dating from around AD 125 to AD 225. Three 1st to 2nd century coins. Four 1st and 4th century coins. Colchester-derivative Harlow brooch, late 1st to mid 2nd century AD. Stone with very high glass on one edge and part of surface. Half a double patard of Duke of Burgundy. Bottom stone of puddingstone quern. September 1995. Northern fringe of site. Nine 3rd to 4th century coins. Roman box or furniture knob with an iron shank. Medieval brooch pin with moulded collar. Copper alloy sheet with holes (possibly for rivets), probably Roman, possibly a vessel fragment. Quarter of a puddingstone quern. Headstud brooch with S pin, later 1st century. Badly corroded. Headstud brooch, S-pin, later 1st century. Badly corroded. Three 1st to 3rd coins. Two Trajan denarii, one almost totally covered in iron pan. Roman brooch, right hand triple hook dating from around AD 40 to AD 55. Middle Saxon pin with flat lozenge-shaped head covered with rather unevenly applied ring-and-dot. Small collar beneath. Circular-section shaft with tip missing. Roman copper alloy ?needle fragment (sharp end only). Blade end of Late Bronze Age socketed axe. A. Rogerson (NLA), 18 July 1999. Four Roman coins, Caracalla denarius, two 3rd century coins and one 4th century coin. Three coins, two from area of thick iron pan. Three coins (no further details). Roman spatulate headed iron lynch pin, see (S4). One 2nd century coin. See list in file. Roman brooch foot, could be rosette, Aesica or wing and fan bow (1st century). Roman decorative stud with dished disc-shaped head. Around the reverse of the head is a little flange in centre of which is a square-sectioned shank which tapers slightly. Corroded, but fragments of polished greyish surface can be seen. Roman swan's head appliqué furniture fitting. Fragment of finger ring. Copper alloy bezel with intact intaglio (found set in iron pan). Copper alloy waste and sheet in iron pan, probably Roman. Cruciform or small long brooch, part of head-plate and bow. All breaks are very worn. Very corroded but double-groove around the head-plate survives with stubs of flat cast-in-one knobs to sides and top. The grooves along the bottom of the head-plate are wider. On the reverse is a pin bar lug with iron corrosion. Medieval square buckle plate in poor condition with frame recesses and pin slot. Traces of gilded relief decoration. It looks as if this was on a separate plate, bits of which have now broken off. Two copper alloy rivets survive. Medieval ?strap end. Copper alloy strip now bent with rivet hole at each end. One end shaped into a shell terminal, with grooves radiating from the rivet hole. Fragment of finger ring. Copper alloy bezel with intact intaglio. Copper alloy waste or very worn? Roman decorated copper alloy stamp with sheared off with square sectioned shank (heavy duty). Two 1st to 2nd century coins. W. Milligan (NCM), October 1998. A. Rogerson (NLA), 1 November 1999. Roman coins and metal finds. A. Rogerson (NLA), 30 November 1999. 92 Roman coins and Roman harness pendant. A. Rogerson (NLA), 25 September 2000. 18 October 1999 and 13 August 2000. Metal-detecting. Four Roman coins, Roman metal finds in areas. A. Rogerson (NLA), 30 November 2000. S. Ashley (NLA), 26 September 2001. Roman, medieval and undatable metal finds. A. Rogerson (NLA), 13 December 2001. 24 August-12 October 2001. Metal-detecting. Middle Bronze Age rapier, (S9). A. Rogerson (NLA), 20 April 2002. One Roman, one medieval and one undatable metal object. See list in file with NGRs. A. Rogerson (NLA), 6 November 2002. Samian sherd with potter's stamp. A. Rogerson (NLA), 15 February 2003. 27 Roman and one medieval coin. See lists with NGRs in file. A. Rogerson (NLA), 9 May 2003. A. Rogerson (NLA), 10 October 2003. One Iron Age and 54 Roman coins. One post-medieval jetton and token. Roman and undatable metal objects. A. Rogerson (NLA), 8 November 2003. A. Rogerson (NLA), 13 February 2005. One Iron Age and ten Roman coins. A. Rogerson (NLA), 8 July 2005. Roman and ?Roman metal objects from five contexts. A. Rogerson (NLA), 23 August 2005. A. Rogerson (NLA), 12 December 2005. 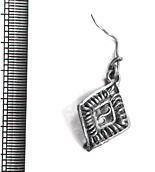 Roman hair pin or needle. A. Rogerson (NLA), 5 October 2006. A. Rogerson (NLA), 7 November 2006. 1 Iron Age, 39 Roman and 2 post-medieval coins, Roman, medieval and medieval/ post-medieval metal objects. A. Rogerson (NLA), 4 November 2008. 20 Roman coins, Roman brooch and 1 post-medieval coin. A. Rogerson (NLA), 5 December 2008. 33 Roman coins, Iron Age brooch, medieval and medieval metal objects. A. Rogerson (NLA), 3 October 2009. 7 Roman and 1 medieval coin, Romano-British brooch and medieval strap-end. A. Rogerson (NLA), 4 November 2009. August-September 2009. Metal-detecting area extended to whole field. Medieval buckle and post-medieval harness mount. A. Rogerson (NLA), 24 October 2009. Iron Age brooch and 5 Roman coins. A. Rogerson (HES), 6 April 2011. A. Marsden (HES), 12 December 2011. Pendleton (S5) considered three Bronze Age objects found 190m apart in 1982/3 at Wicklewood/Wymondham HER 18111 as a hoard. This as a dubious association. A. J. Lawson, 20 February 2012. A. Rogerson (HES), 8 March 2012. One Late Iron Age, sixty-one Roman and one medieval coin, three Roman brooches and one medieval brooch made from a jetton. S. Ashley (HES), 8 May 2012. Six Roman coins and Roman copper alloy nail. A. Rogerson (HES), 4 July 2012. A. Marsden (HES), 16 October 2012. Undated incomplete unidentified copper alloy object. Late Iron Age/Roman Colchester-type bow brooch. 1 medieval coin and incomplete buckle plate. Medieval/post-medieval discoidal lead weight and a fragment of the handle of a chafing dish or cupboard door. A. Beckham (HES), 12 March 2013. 4 Roman coins and copper alloy hair pin. P. Watkins (HES), 4 July 2013. 3 Roman coins and a brooch. --- Photograph: XV1 to XX111. --- Aerial Photograph: Edwards, D.A. (NLA). TG 0803D,E ; TG 0903AZ-ABA. --- Newspaper Article: Eastern Daily Press. 1985. Roman road and base discovered. 13 September. --- Photograph: X ray. NX 5507. --- Archive: Ordnance Survey Staff. 1933-1979?. Ordnance Survey Record Cards. TG 00 SE 2. --- Photograph: 1999. KSP 25-26, Romano British brooch. --- Photograph: 1999. KSP 27, Romano British brooch. --- Photograph: 2002. KTF 16-18, Romano British stud head of silenus..
--- Archive: Clarke, R. R. and NCM Staff. 1933-1973. Norwich Castle Museum Record Card - Roman. Wicklewood. --- Illustration: Woollestone, D.G. (NCM). Unknown. Drawing of nine Roman , medieval and post-medieval finds.. Paper. Unknown. <S1> Article in serial: Trett, R. 1983. Roman Bronze 'Grooved Pendants' from East Anglia. Norfolk Archaeology. Vol XXXVIII Pt III pp 219-234. pp 231-232. <S1> Photograph: NLA. Finds Photograph. <S4> Photograph: X ray. NX 5761. <S5> Article in monograph: Pendleton, C. F.. 1999. 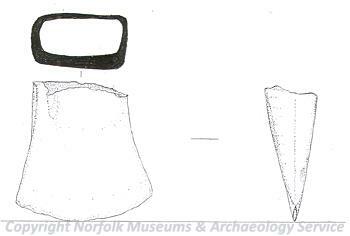 Bronze Age Metalwork from Northern East Anglia. A study of its distribution and interpretation. IN British Archaeological Report British Series Volume 279. BAR British Series Volume 279. 207. <S6> Illustration: Hirst, N.. 1989. Drawing of a Bronze Age sword fragment.. Paper. Unknown. <S7> Illustration: Kercher, J.. 1998. Drawing of a Bronze Age axe head fragment.. Card. 1:1. <S8> Illustration: Kercher, J.. 1998. Drawing of a Bronze Age axe fragment.. Card. 1:1. <S9> Illustration: Ashley, S.. 2001. Drawing of a Middle Bronze age rapier.. Film. 1:1.